The Himalaya, roof of the world, is a magic place where the magnificence of the world's highest mountains is mirrored in the rugged beauty and unique culture of the people who live in their shadow. Jim Corbett National Park is 115-km from Nainital, via Kaladhungi. The pride of Corbett National Park is the distinction of being the first national park of India. It sprawls over an area of 1,200-sq-kms and was established in the year 1935 as the Hailey National Park, after Sir William Malcohm Hailey, an enthusiastic conservationist who was at that time governor of united provinces. In 1957, the park was re-christened as the Corbett National Park in the memory of late Jim Corbett, legendary sportsman, great naturalist, eminent conservationist and a profilic writer, who spent some of the best and happiest years of his life in Kaladhungi and Nainital. Aptly called the land of roar, trumpet, and songs, Corbett Park is a legend come alive. The park embraces the picturesque patladiun, a broad flat valley consisting of the vast savannas and surrounded by hills. Most of the core area of 330-sq km at its heart remains out of bounds, and many visitors are disappointed to find that safaris on foot are strictly forbidden; they are only permissible in the fringe forests. Corbett is most famous for its large cats, and in particular the Tiger - this was the first designated Project Tiger Reserve, in 1973 - but its Tigers are extremely elusive. Sightings are very far from guaranteed, and should be regarded as an unlikely bonus. Corbet holds a great asortment of other animals. Large Elephant herds have been confined within its boundaries since the construction of the Ramganga Reservoir blocked migratory routes that formerly ranged as far as Rajaji National Park, 200-km west. The best place to see them is around the picturesque Dhikala Camp near the reservoir, especially in spring, when the water level drops and the animals have more space to roam. The reservoir shelters populations of Gharial, a long snouted fish-eating Crocodile, and Maggar, a large marsh crocodile, and other reptiles. Jackal are common, and Wild Boar run through the camps in the evenings. The grasslands around Dhikala are home to deer species such as the spotted Deer known as Chital, Hog Deer and the larger Sambar. Rhesus and common Langur are both abundant, representing the two main classes of Indian Monkeys. Bird life ranges from water birds such as the pied Kingfisher to birds of prey, including the crested serpent Eagle, Pallas's fishing eagle and Himalayan greyheaded fishing Eagle. Situated in the rich farm belt of Terai, on the southeastern fringes of the great forests, the busy market town of Ramnagar is the main administrative centre for Corbet National Park and Project Tiger. Ramnagar makes a fishing base camp. At Lohachaur, 15-kms north along the River Kosi, good anglers are in with a chance of landing the legendary Mahseer, a redoubtable battling River Carp. Permits to have a go must be sought from the Project Tiger office in Ramnagar; most resorts also arrange all inclusive fishing trips. 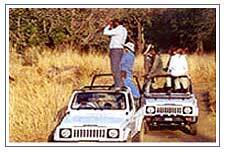 Jeeps Safari, is the most convenient way to travel within Corbett, and can be rented for the park trips from Ramnagar, from the KMVN Tourist Lodge and other travel agencies . One bus each day goes to Dikhala from Ramnagar, stopping at the Forest Rest houses en route. Chital, Sambar, and various other Deer species find refuge in the Savannah grasslands known as the Maidan, behind the campsite to the south, and Tigers are occasionally drawn in looking for prey. Two hour Elephant rides, explore this sea of grass, rarely penetrating far into the deep jungles beyond. Come early morning or evening; in the heat of the day you probably won't come across much more than deer among the tall grass. Tiger-sightings are few and far between, but you may be rewarded with fresh pug marks. Phoolbagh, Pantnagar at a distance of 50-kms is the nearest airport. Delhi at a distance of 300-kms is the nearest international airport. Ramnagar is on the broad gauge track from where the road transport options have to be availed to reach the park. For faster trains and connections to other parts change at Moradabad. Dhikala is 300-kms from Delhi, 145-kms from Lucknow and 51-kms from Ramnagar. The route from Delhi spans Hapur-Murababad-Ramnagar. The turn off is some 7-kms beyond Muradabad to the left, marked by a small board. The route from Lucknow spans Bareilly-Kichha-Rudrapur-Doraha-Kashipur. Ramnagar is served by frequent buses to and from Nainital and Ranikhet, 112-kms north. Buses arrive every half hour or so after the eight hour trip from Delhi; Delhi Transport corporation run a semi deluxe service, and most of the alternatives are pretty basic. 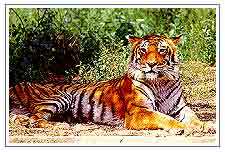 All visitors to Corbett National Park have to obtain permits from the park administration centre at Ramnagar. The closest of the various gates into the Corbett, 1-km from central Ramnagar, is on the road to Bijrani camp, 11-km away, a base for day trips. Dhangarhi Gate, 18-kms along the highway north to Ranikhet, provides access to the northern and north western portion of the park along the Ramnagar River valley, and to the main camp of Dhikala.